All moving parts and the seals of the valve are assembled in a cartridge. O-rings on the outer surface of the piston guarantee a hermetic seal of valve paths. When the valve stem is in its low position, and path B is closed, flow takes place in paths A and AB, passing through the holes in the cylindrical shut-off. When the stem is in its high position the flow in path A is blocked and takes place in paths B and AB. Switchover from one path to the other takes about 6 seconds. 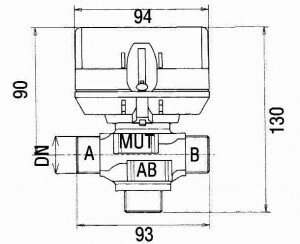 A lever is positioned on the side of the servomotor that permits manual positioning of the shut-off ball in an intermediate position. The manual lever can only be manoeuvred when it is in its upper position. 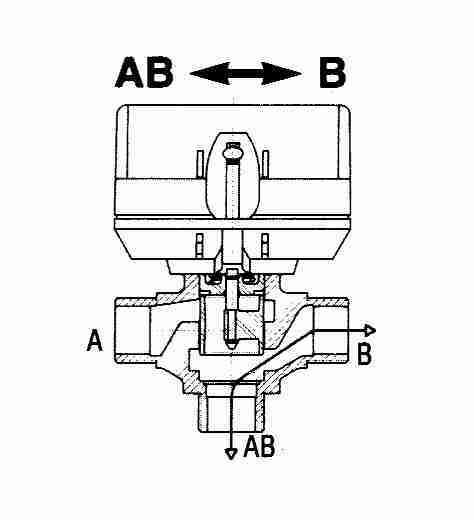 The valve can be opened by firmly pressing the manual lever both down and in until it locks in the intermediate position. Paths A and B are open in this position. This is useful when filling or emptying the pipeline system or when there is a power failure. VMR valves are motorised valves used in home applications and small installations to control the flow of hot and cold water. They can be used as shunt or mixing valves in centralised heating or cooling systems. 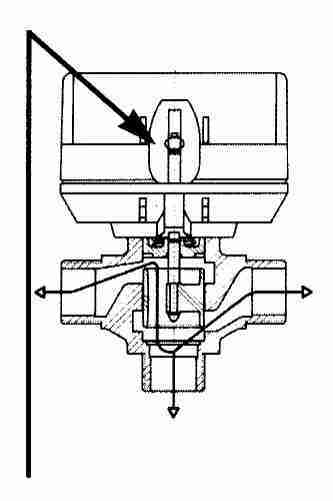 The valve, thanks to its cylindrical shut-off, shunts flow independent from the different pressures between the various paths. This shut-off can have two operating positions depending on how the electric motor that moves is powered. The head of the valve can be removed without opening up the plumbing system: this makes valve maintenance quick and flexible. 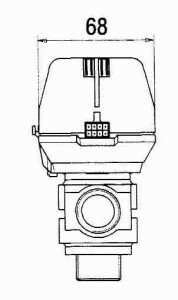 An auxiliary microswitch can be installed on request and be activated when the valve is switched. 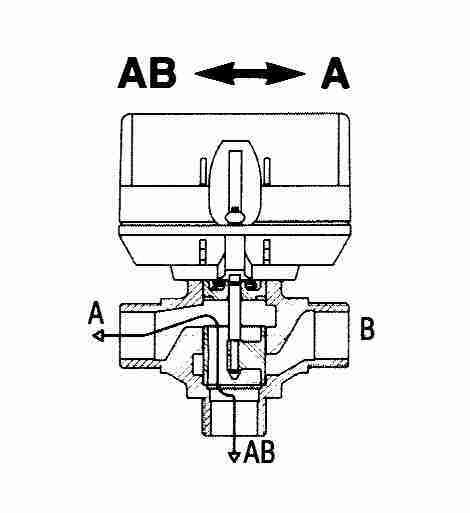 Valves have an external lever for manually positioning the shut-off in its central position. A two-pole microswitch (M1 version) can be mounted on all versions. The microswitch M1S cannot be installed in versions which do not mount them originally. - two-pole SPDT three-wire external control: when there is a request for hot water the control unit (SPDT) closes the NO contact, the valve closes path B and opens path A. When path A is completely open the cam closes travel limit microswitch C1 and opens travel limit microswitch C2. When the demand for water is satisfied the control closes contact NC, powering the valve through C1 and causing closure of path A. When path A is completely closed the cam closes C2 and opens C1. The valve is now ready for the next request for hot water. 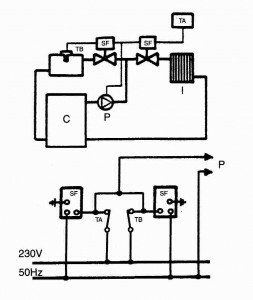 - single-pole SPST two-wire external control (2 wires and common): when there is a request for hot water the control unit (SPST) closes contact N, that powers the relay which in turn closes the contact NO (microswitch C3).This causes the closure of path B and opening of path A. When path A is totally open the cam closes travel limit microswitch C1 and opens microswitch C2. When the demand for water is satisfied the control opens contact N and consequently the relay is no longer powered and contact NC (microswitch C3) is closed. This causes the closure of path A and opening of path B. When path A is totally closed the cam closes C2 and opens C1. The valve is now ready for the next request for hot water. 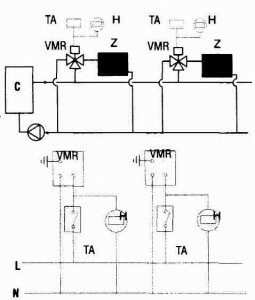 Example: VMR 20 E SPDT CR M1: : VMR 3-way valve with G 3/4″ external thread connections according to UNI ISO 228/1, two-pole external control, MOLEXTM quick connector, single-pole auxiliary microswitch and 220-240 V motor. The zone room thermostat controls opening and closure of the relative VMR valves. When there is no demand it interrupts power to the valve which closes the zone and circulates water back to the boiler return circuit. Installing a meter as illustrated in the diagram permits efficient sharing of operating costs. It is good practice to balance load losses in the recirculation pipeline to avoid excessive flow rate variations in other circuits during valve operation. We use this installation system mainly on combined boilers to permit the temperature of domestic hot water to be adjusted at the desired value. 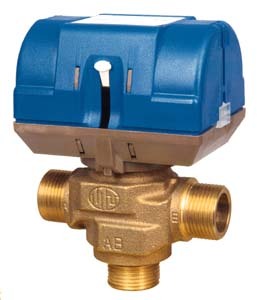 The valve is used for priority over the heating system.